Having grown up in the province of Milan, I only became familiar with piadina during one of my family’s summer trips to the Adriatic seaside resort of Emilia-Romagna, a popular destination for Italian and north European tourists who are looking for long sandy beaches, shallow Mediterranean waters, amazing food, and exciting nightlife. I remember trying my first piadina in a small theme park called Fiabilandia, in Rivazzurra di Rimini. It was filled with prosciutto crudo, and for me, it was a welcome revelation—one of the first of the many kinds of Italian regional food that I went on to discover! This recipe was given to me by a friend who was born in Romagna. It makes use of a small amount of baking soda (sodium bicarbonate) which acts as a raising agent by releasing carbon dioxide at temperatures above 80 °C, making a light, friable flatbread. Besides cooking, baking soda has many other uses as summarized in this comprehensive article. In an electric mixer using the dough blade, combine flour, baking soda, and salt. Add the margarine and mix until evenly combined. Slowly add the water, mix until the dough forms a mass around the hook. Knead until smooth, 5 minutes. Divide the dough into four equal pieces and roll each piece into a ball. Wrap the balls in saran wrap and let them rest at room temperature for 30 minutes. Using a rolling pin, roll each ball into a thin disc, 7 inches in diameter. If you want perfectly round piadine, press a similar sized lid onto the rolled dough, then remove the excess around the edges. Warm up a non-stick pan on the small burner, at a medium heat. Allow 5-10 minutes for the pan to reach a stable temperature. 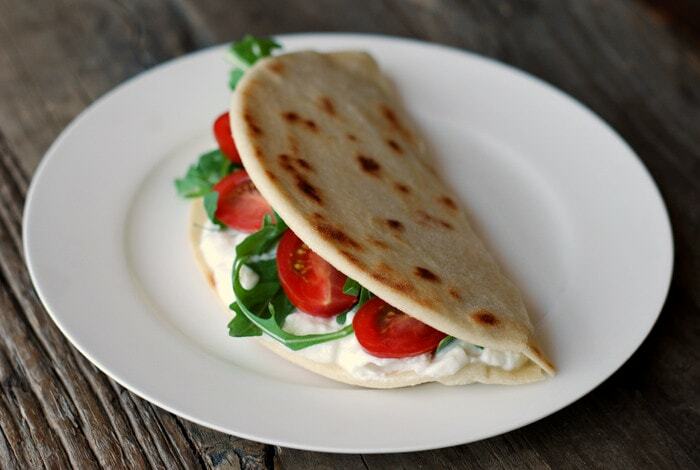 Cook one piadina at a time, for about 2-3 minutes on each side. If big bubbles begin to form, flip the piadina sooner to keep the bubbles from growing. Continue cooking, flipping as necessary, until lightly browned small blisters appear on the side in contact with the heat. Remove the piadina from the heat and let it cool until lukewarm, then fold it in half and fill it with the cheese, rocket, and cherry tomatoes. * Salted margarine contains 7 mg of sodium per gram, therefore 2 oz of margarine contain 400 mg of sodium, which correspond to 1/6 teaspoon of salt. Mom prepared the flatbread and we called it “pieda”. Both recipes are remrakably similar, right down to the lard. Her family was from Marche and Dad’s family still lives in San Marino. Although she used sautéed greens to fill hers, I’ve used them to make panini of all kinds. I’d like to try your filling and will need to find the cheese component. Thanks for sharing your recipe and sending me down Memory Lane. I tried piadina many moons ago on a trip to the beach near Rimini. I enjoyed it very much, but I never thought to try it at home. It doesn’t sounds too difficult. May give it a go! 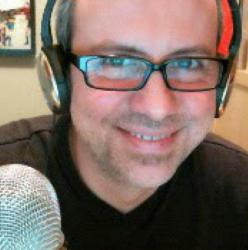 Hi, Frank, let me know how you like it – I was surprised too, the process is a very forgiving and fast. Since you’re not a vegetarian, I’ll look forward to your rendition with prosciutto crudo, as tradition demands. I don’t know how I missed this post, Paolo, but I am glad you mentioned it in your “year in review!” I have a question, though, you say that the lard could be replaced with margarine or olive oil, but you don’t mention butter. Is there a reason? Will butter act differently? I definitely want to try to make these piadine… Will check back for your response! All best, my friend. Hi David! I’m glad the year in review was useful. Thanks so much for this question, as always very much to the point. To be honest, I didn’t mention butter because it didn’t cross my mind, based on my experience with piadina. It would probably taste good, but flavor-wise it might turn out into a biscuit, I think. Piadina, instead, asks for a fat that is “sharp” and neutral in flavor, not at all creamy. And this is pretty much the only use of margarine that I can think of! If anyone from Romagna is reading this, however, I’d be very curious to hear their thoughts! Hi Paolo! I have just discovered your blog! It is great! I am originally from Verona but live in Michigan now. I have obtained some lard from a local farm and would like to use it for piadine. Do I replace the margarine with the same amount of lard? Hi Raffaella, nice to meet you and thanks! Yes, I think equal amounts will work well. I tried piadina many times. I enjoyed it very much, but I never thought to try it at home. It doesn’t sounds too difficult following your instructions. Thanks for sharing.